When we can engage in the exercise of expelling the stale breath with real presence of mind, then it can be quite powerful. It can purify the obscurations of our speech and the obscurations of the mind. So when we meditate, or the process of meditation, is a means to progress in the direction of virtue, or it is a virtuous activity in and of itself. It is a method of turning the body, speech, and mind towards virtue. When it comes to practicing virtue of the body, speech, and mind, the most important is the mind. So the degree of our virtuous intention in our mind determines the degree of the virtuous intention overall – the virtuous intention of body, speech, and mind. So when it comes to recognizing what is a virtuous intention, the qualities such as renunciation, love, compassion, the wish to benefit others – these are all virtuous intentions. So at the outset of our meditation, it is really important that we generate a motivation that is based on these positive qualities so that our meditation is really of a virtuous nature. Particularly, if we can generate the vast mind of virtue, by generating bodhichitta, if we generate bodhichitta, this bodhichitta is the vast mind that embraces the welfare of all sentient beings. So one’s intention is to engage in dharma practice and virtue, not just for one’s own benefit, but for the benefit of all sentient beings, without exception. So first, if we give rise to compassion, thinking about the suffering of limitless sentient beings, with an authentic mind of concern, to the point that you feel that you just can’t bear to see others suffering. 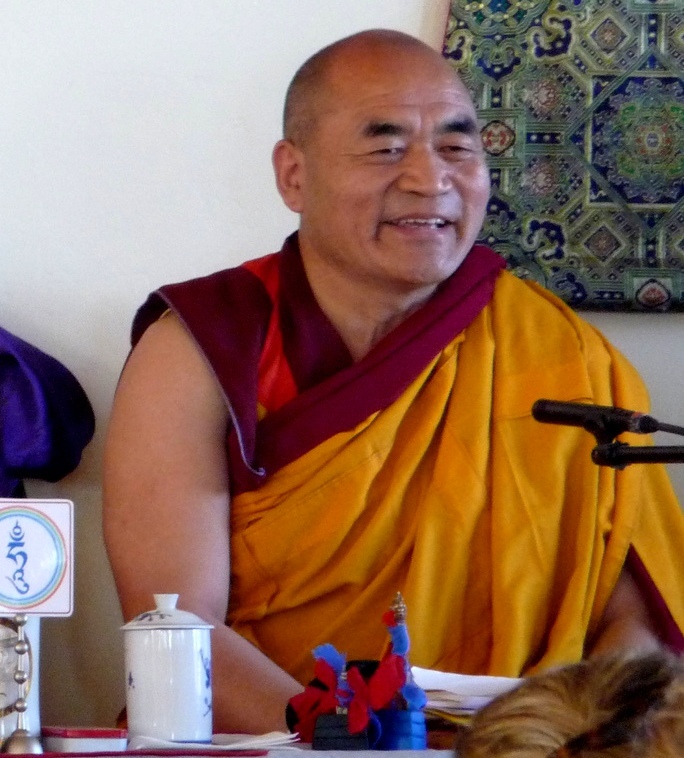 Based on this mind of compassion, then if we wish to bring all sentient beings who are suffering out of their experience of suffering and place them in states of happiness, so with the wish to place all beings in temporary and ultimate happiness, we set about engaging in virtue with that objective in mind. If we have a really vast intention like this, this is bodhichitta. Bodhichitta is the compassion that has the objective of sentient beings, united with wisdom, which has the objective of attaining complete enlightenment. The union of these two is the mind of bodhichitta. The third of the preliminaries for the meditation is establishing the mind of devotion. The mind of devotion is like the door to meditative absorption. So at the outset of our meditation, after we have established the correct posture, and engaged in the exercise of expelling the stale breath, then we meditate on our root lama in the form of the deity at the crown of our head. So according to different lineages there are different traditions. First of all, developing a mind of faith and devotion towards one’s spiritual teacher, towards one’s root guru, who is the one from whom one receives the teachings, transmissions, and empowerments, then if one belongs to the Kagyu tradition, one can meditate on the form of Vajradhara at one’s crown, who is in essence the same as one’s root guru, or spiritual teacher. Then in the Nyingma tradition, the Nyingthig tradition, if one’s spiritual teacher is a fully ordained monk, then one can meditate on the spiritual teacher in the form of Shakyamuni Buddha, and if one’s teacher is a ngakpa, then one can meditate on him in the form of Guru Rinpoche. Whether it is Vajradhara, or Shakyamuni, or Guru Rinpoche, or if one has a yidam deity that one practices, then one can meditate on the guru in the form of the yidam deity, whether it is Chenrezig or whatever yidam deity that one generally practices. Then one can meditate on one’s yidam deity at the crown of one’s head. Whatever enlightened form that one chooses to meditate on, then the deity is inseparable from the mind of one’s root guru. So Guru Rinpoche, or Vajradhara, or whichever form one chooses, is sitting at the crown of one’s head, upon a lotus and on top of the lotus is a moon disc. This lotus and moon disc seat is placed on top of a jeweled throne, that is held up by snow lions. On top of this throne is the lotus and on top of the lotus is the moon disc seat, and then seated on top of the lotus and moon disc seat, is one’s root guru in the form of Vajradhara, or Guru Rinpoche, or Shakyamuni Buddha, and so forth. So when one meditates in this way, on one’s guru at the crown of one’s head, one should do so with the five pure perceptions. So one should visualize or feel, generate the perception of one’s spiritual teacher as the Buddha in person. There are the explanations for doing this based on scripture and based on reasoning. So one generates the perception of one’s teacher as being the Buddha in person. So generally our mind is vulnerable to the constant arising of the affllictive emotions, and it is difficult for the mind to rest in one-pointed concentration, or to calmly abide in stillness, because of the karmic imprints of these affllictive emotions. Because the karmic imprints of obscuration are very strong, they are very thick, it is difficult to abide without the mind becoming distracted, without following after the conceptual delusions of the mind and so forth. It is really difficult to do this because of the thick karmic imprints that exist in the mindstream. So when we practice calm abiding, then we strengthen the mind’s ability to abide single-pointedly in a peaceful stillness. So there are two types of shamatha meditation, or two types of calm-abiding meditation. There is that that relies on a support and that that is without a support. So the type of calm-abiding meditation that relies on a support is, for instance, taking an object and placing this in front of one, in one’s field of vision, directly in front of one, like a small object, like a small white stone. Then you rest your eyes, your gaze, should be rested, loosely and gently on that object of meditation – on this white stone that is placed in front of you. Then when the gaze is resting gently on the object in front, then the mind also is resting together with your gaze. So without becoming distracted by the thought forms of the mind, then you rest your mind together with the support of your gaze on that object. One can choose to use as one’s object of meditation a representation of the Buddha’s enlightened form, like a small statue or an image of a deity. One can place this in front and in the same way as with the white stone, you can rest your gaze on the form of the deity and allow your mind to abide with single-pointed focus on the form that is placed before you. Another method is to gently rest your gaze at the tip of your nose without allowing the eyes to move around and look at different things. This is the purpose of an object of focus. Generally, if our eyes are moving about and looking at different things, then it is particularly difficult for the mind to stay still. So when we give ourselves an object of focus to gently rest the gaze upon, then the mind just naturally settles in a state of stillness together with the gaze. And so again one can focus one’s gaze at the tip of the nose. Whatever one chooses as an object of focus, one should rest one’s mind gently on this object of focus without becoming wrapped up in the thought forms that arise in the mind. Another method, particularly if one has a difficult time establishing stillness with the mind or stability in one’s meditation, if it is difficult to abide with single-pointed focus, which it generally is in the beginning, then one can alternate one’s object of focus. So, for instance, we also have analytical meditation and we can use analytical meditation as our object of focus. Generally, if we start to get wrapped up in thoughts, and if they are thoughts that are based on attachment, aversion, or ignorance, then the mind has gone in the direction of non-virtue. So in order to pull the mind back and direct it in the direction of virtue again, then one can use analytical meditation based on the teachings. So, for instance, generally we choose our object of analytical meditation according to whatever progressive stage in the path. So, beginning with the Four Thoughts That Turn the Mind, for instance, if you have heard teachings on the difficulty of obtaining a human birth complete with the leisures and endowments, then as an object of meditation, you can contemplate the difficulty of obtaining a human birth complete with the leisures and endowments based on teachings you have heard or based on texts you have read. Contemplate it, think about what it is that you have heard, why it is that it is so difficult to obtain a human birth with the leisures and endowments, and so forth. Think about it in a way so that you can identify with it to the point where you really establish a feeling of certainty, a feeling of conviction, when you feel like ―that’s really true, it’s so incredible that we have this opportunity in which we have a precious human birth with the leisures and endowments and this is really a situation that I shouldn’t let go to waste.― I should really use this precious opportunity to engage in virtue. When you have this feeling of certainty, and then maybe when the mind becomes tired from the analytical contemplation, then when you don’t want to think about anything, once you have tired yourself out through the process of analysis, then let go of the analytical meditation and let the mind relax in stillness without any object of focus, without focusing on any object in particular. Just allow the mind to rest in stillness without becoming wrapped up in any kind of conceptual processes or thoughts. In this way, you can alternate between the analytical meditation and the resting meditation. So first you can meditate on the difficulty of encountering a human birth complete with the leisures and endowments, and once you become pretty clear about that, you can move on to impermanence, the faults of cyclic existence, karma cause and effect, and so forth. With the analytical meditation, you use your mind to establish certainty with respect to the instructions, with respect to the words of the teachings. Then when the intellectual understanding is clear, one develops a real sense of identifying with the truth of these teachings to the point where you feel a real sadness at the suffering of samsara and give rise to an authentic sense of renunciation. When you give rise to an authentic sense of renunciation, then the wish for liberation arises, and you have a really strong, authentic desire to seek liberation and enlightenment with a genuine understanding of the essencelessness of samsara, cyclic existence. In this way, developing the analytical meditation increases and strengthens the faculty of wisdom. Then when we become tired with the analytical meditation, we can let the mind rest in meditative absorption without any particular focus, just establish the still abiding of the mind. Then you can alternate back and forth between these two. This is a good method because it strengthens the aspect of wisdom and it also strengthens the aspect of abiding in stillness, or one-pointed concentration. So abiding in one-pointed concentration is shamatha, or calm-abiding meditation. When we have the aspect of wisdom in our meditation, this is Vipassana, or special insight, so this kind of alternating strengthens both the aspects of calm-abiding and special insight. The benefits for establishing or developing meditative absorption are very great and very vast. The reason for this is because generally when we think about what it is that our mind is pre-occupied with or where it is that we generally place our mind, our mind is generally wrapped up in discursive thoughts that are based on afflictive emotions, the afflictive emotions of attachment, aversion, and ignorance. Generally, the delusions of the mind are really only of a non-virtuous nature. They are generally only concerned with non-virtue. Usually, we are distracted by beautiful, pleasant forms. If we see forms that we behold with our eyes, we have attachment to those that seem appealing. We consider them to be good and we wish to possess them or own them, or gain them, and this is desire. Otherwise, we encounter things that we have aversion to, that we consider negative and then we develop aversion, or hatred, or anger towards them, and this is non-virtue. Or we are generally pre-occupied with neutral thoughts that are based on ―oh, I need to do this, and I need to do that, and I shouldn’t forget to do that‖ and all of these sort of meaningless activities and so forth. One is concerned with meaningless thoughts and that falls into the category of ignorance. There are all these thoughts that are endlessly arising in the mind that we completely identify with, attach to and consider to be somehow substantial and important. We attach to these thoughts and identify with them without recognizing that they are fueled by the negative emotions or afflictive emotions. So whenever our thoughts are preoccupied with any of these negative emotions then we are engaged in non-virtue. These thoughts of non-virtue only perpetuate the root of suffering. They only continue to fuel samsara. When we change our focus from one of non-virtue to virtue, when we transform our habit of thinking, transform our habit of generally being pre-occupied with thoughts of non-virtue, and fueling and perpetuating thoughts that are based on non-virtue. When we instead train ourselves to perpetuate the thoughts that are based on virtue, thoughts of love and compassion, bodhichitta, the wish to benefit others, renunciation and so forth, faith and devotion, this is the actual process of purifying the mind. Our mind can only be concentrated on one thing at a time. Even if our thoughts occur in seemingly small moments, at one moment, the mind can only be focused on one thing. So if it is virtue that is in the mind, then there cannot be non-virtue. Likewise, if there is non-virtue in the mind, there cannot be virtue, because the mind can only think about one thing at a time. But these are still just experiences. The experiences of bliss, clarity, and insight are experiences that come from concentration. Then the further that one’s meditation is developed through these experiences, then when the illusion of the experience is shaken off, or once one passes beyond the experiences, then one realizes that there is no need to have attachment to these temporary experiences of bliss, clarity, and non-thought, and one attains a certain level of freedom from attachment to these experiences, one experiences a more profound level of insight in which one realizes emptiness. So the true nature of the mind or the true nature of emptiness is realized but there is still a subtle attachment to that realization of emptiness and the sort of revelation of ―this is emptiness‖. Even as one’s meditation develops through this then eventually this attachment is shaken off or transcended and then one realizes the true nature of the mind without any fault of fixation or without any of the veils of experience and so forth like the experiences of bliss, clarity, and non-thought.